Everyone loves a good GIF. Whether it’s of a cat or of Obama’s face squinting into the sun, GIFs are our tickets to instant entertainment, right smack in that sweet spot between pictures and data-draining videos. But the real power lies in creating your own GIFs. And that’s where GifBrewery comes in. The highly flexible GIF-making tool is one of the easiest to use on the market. You might find GifBrewery complicated when you’re just starting out, but it’s actually pretty easy to navigate. The first step is to upload a video onto GifBrewery, and let it load. It will then open up in a window where you can play it like you would on VLC or Quicktime. This is where it gets fun. Obviously, turning the whole video into a GIF defeats the purpose of making a GIF in the first place, so you’ll have to start trimming it. The yellow and red triangles are the markers for the beginning and end of the video section that will be converted into a GIF. Play the video until you reach the beginning of the section that you’d like to convert into a GIF, and click “Set Start”. Then continue playing the video and click “Set End” for where you want the clip to end. Alternatively, you can just drag the triangles, but that gets a bit fiddly. You can then click “Go To Start” to check the selected clip and see if it’s good enough. 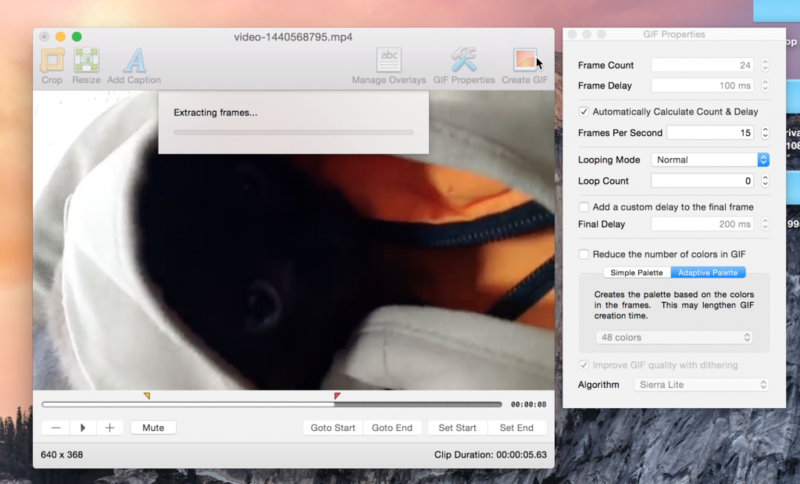 At the bottom of the video window, you can also see the Clip Duration (how long the selected clip is) and the size of the GIF that will be produced. Both the duration and the size will affect the quality and the speed at which the GIF is created, so keep tweaking until you get it right. You wouldn’t expect it, but the real magic behind great GIFs boils down to the numbers. There’s a subtle science to it, but don’t worry, you don’t need to be good at math to make a good GIF. But here’s a quick breakdown: Frame Count is the number of pictures within a single GIF (since GIFs are technically a series of pictures put together into a single image file). Frame Delay is the time, counted in milliseconds, between each frame. They both correspond to a single number in Frames Per Second, which can be automatically calculated for you so you can just play with a single number. A good number for frames per second is between 10-15 — any higher will make the image huge and almost impossible to put on any social media platform, and any lower will make the GIF look like streamed video with a painful amount of lag. So tweak it until you get a good and well-timed GIF. Do keep in mind that the length of the clip also affects the speed of the GIF (the longer the clip, the more sped up it will be) and the quality of the GIF. If needed, you can also edit the images themselves to make them clearer, or to rotate them. On the top left hand corner, you can either crop or resize the image. If the image is too dark, you can go to the top bar and select Filter, under which you can adjust colours or even create weird effects, like pixelate the GIF or create a comic book effect. If you just want to rotate or flip the image, go to GIF and edit it from the drop-down menu. Now that you’ve got the boring parts down, it’s time to go nuts. Instead of just letting the GIF run linearly, you can edit it to make it go in reverse, or in palindrome mode, which basically makes it go back and forth forever. You can tweak these from the GIF properties table. Or if you want to go really insane, try to add text and image overlays. You can add them from GIF > Overlays, and set where they appear in the GIF through Manage Overlays. Select the image or text, and similar to how you would select the video clip, play the video until the point you want the image or text to show up, then click “Set Start”. Do the same for the end of the video. This is what I came up with using a png file of Chris Hemsworth’s face. Because I can. Once you’ve done all of the above, you can click Create GIF to preview the GIF. In the top left corner, you’ll also be able to see how large the GIF file is. The size of the file depends on many different factors, like the images/text that you add, the length of the video clip, the pixel size of the GIF, etc., so keep tweaking until you find a good size for your wonderful creation. GifBrewery is only available for Mac users in the App Store, and costs $4.99.